MANILA, Philippines - The complete list of winners of the Philippine Popular (Philpop) Music Festival 2015 was officially announced during the finals night held on Saturday, July 25 at the Meralco Theater in Pasig City. Musicians from different genres battled for the most prestigious annual songwriting competition in the country which aims to celebrate the talent of Filipino songwriting, glorify the contributions of songwriters and composers to the Filipino music industry. From the many song entries in this year's competition, 12 songs were chosen, "Triangulo," by Philpop 2013 champions Thyro Alfaro and Yumi Lacsamana won 1 million peso Grand Prize for PhilPop 2015 Festival. Meanwhile, runners-up Davey Langit ( "Paratingin Mo Na Siya") and Mark Villar ("Sa Ibang Mundo") received P500,000 and P250,000 respectively. Special award winners took home P100,000 each. Each awardee received special trophy commissioned from glass sculptor Ramon Orlina. 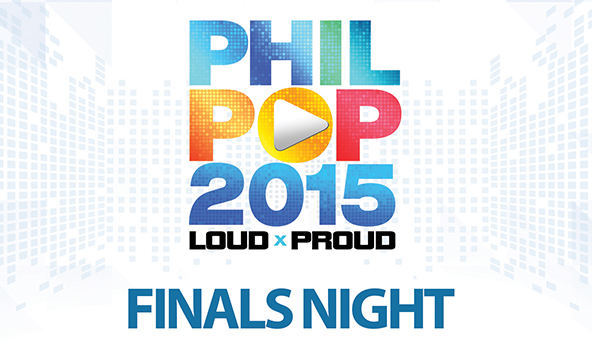 Philpop 2015 finals night was hosted by Viva talents Mark Bautista, Bela Padilla Sam Pinto, and Chris Schneider. Artists who performed production numbers in the event's culminating spectacle were Andrew E., Mark Bautista, Dingdong Avanzado, Jennifer Lee, and the 2014 World Hip Hop Champions, ATeam. The event will be airing on TV5 at 10 PM Saturday night.